WAIMEA, Hawaii » The sun has some weird next-door neighbors. Astronomers using the Hubble Space Telescope and the W.M. Keck Observatory on Mauna Kea have produced images of a huge, lopsided disk of debris around a nearby star. They are calling it the "blue needle" because of the appearance of the disc seen on edge. 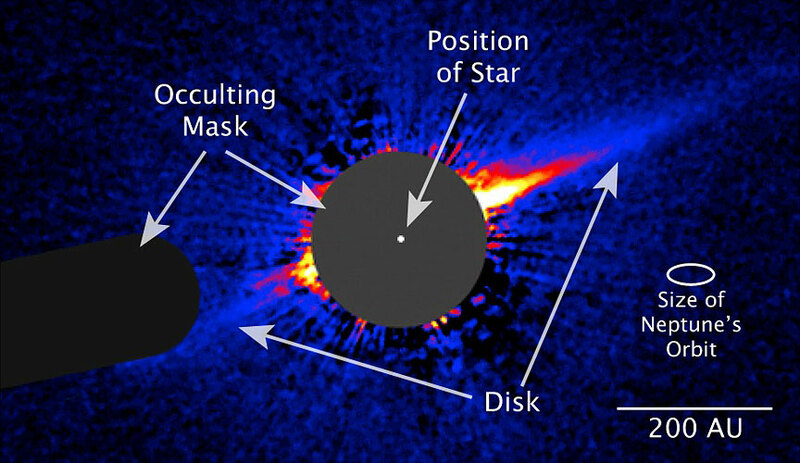 About 100 other stars are known to have discs, but the blue needle is "far more asymmetrical" than any of its companions in a nearby collection called the Beta Pictoris Moving Group, a Keck announcement said. The loose group is almost next door in astronomical terms, 33 to 163 light-years away in the constellation Pictor, the painter, in the Southern Hemisphere. The blue needle disc extends around a nameless star designated HD15115, a bit bigger than our sun but a mere baby at 12 million years old. The sun is 4.5 billion years old. The sun has a collection of debris out past the orbit of Neptune called the Kuiper Belt. The blue needle disk starts about the same distance from HD15115 but, because of its extremely elliptical orbit, extends 10 times farther than the Kuiper Belt, Keck said. Traces of the needle have been detected out from its star 550 times the distance from the sun to Earth, a standard measuring stick called an astronomical unit. The needle was indirectly detected in 2000 and imaged by the Hubble telescope in 2006 by a team led by Paul Kalas and James Graham of the University of California-Berkeley. The odd shape led the team to do follow-up work in infrared light at Keck. Comparing images, the astronomers then realized the needle was blue, a rare color for such disks. Why the disc is so needlelike is uncertain, but Kalas thinks a smaller star, 10 light-years from HD15115, is pulling matter in its direction. The disk is also thinner than comparable discs, perhaps also because of the other star pulling matter away. "Perhaps the mechanism which perturbed the disc into its current asymmetric morphology also shaved away a significant fraction of the mass," Kalas said. "The blue needle presents a host of new challenges for theorists," he said. The findings of Kalas' team have been accepted for publication in Astrophysical Journal Letters.